Police Department 119 E. 7th Street. Police Department Clerk Hours: 8 AM - 4 PM. 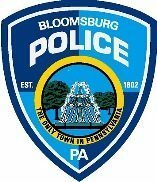 The Bloomsburg Police Department offers permit parking for those individuals living in a Resident Permit Parking area. Residential Permits are required in the densely populated areas in town, particularly near Bloomsburg University. There are 2 signs on every block where these permits are required. First, Fair and Pine Streets : 24 hours, 7 days a week. Permits are issued annually at the police department in August. Enforcement begins September 1st. All permit sales are non-refundable. Proof of Residency (A signed copy of your lease or current utility bill with your name & town address), vehicle registration and photo ID are required. This permit allows you to park on the street(s) in the area designated on your receipt. Please read your receipt carefully so that you know where you are permitted to park. The rules are stapled to this receipt as well. Make sure permit is hanging clearly visible at all times, facing out from your rearview mirror while parking in your designated area. If it falls down or you forget to put it up, you will get a ticket and you will be responsible for that ticket. The fine for No Permit Visible is $40.00. Your license plate is written on the permit, it is only good in that vehicle. If you get a new vehicle or have to borrow a vehicle, you must come to the station with your permit and new registration and photo ID and we will update your permit. The visitor pass is valid in any vehicle. No Parking Signs are posted on your block. You must not park during the day and time listed (All year long – every week). Please stay off the street the entire time listed on the sign. When you move your car on these days, you must stay in your designated area. The fine for Disregarding No Parking Signs is $40.00. Permits expire August 31st of every year. It is the resident’s responsibility to renew by that date. This is announced on our website, Facebook and The Press Enterprise.